Pelican International is renowned as a global leader when it comes to designing and manufacturing canoes, kayaks and fishing boats but it also produces a mean paddle board too! You would be forgiven for thinking Pelican paddle boards might not be of the same quality as the rest of its stock but the company has really tried hard to create outstanding SUPS which we review below. A multi-purpose board designed for light surf or flat water use and Pelican claim it is an SUP that ‘won’t break the bank’. Whether you are a beginner or intermediate paddle boarder, you can rely on a great ride. The Rush 11.6 is an excellent way to enjoy waterways in peace and quiet and its lightweight foam core is surprisingly durable thanks to the polyethylene outer shell which ensures the SUP’s longevity. Paddle boarding is one of the best ways to exercise if you love the water and if this is the case, you should enjoy the padded anti-slip deck pad and bow bungee that comes with the Rush 11.6. As the name suggests, this Pelican stand up paddle board is 11’6” which is a reasonable size; however, it weighs 45 pounds so you don’t want to be lugging this thing around for miles! With a maximum capacity of 230 pounds it can carry just about any rider! 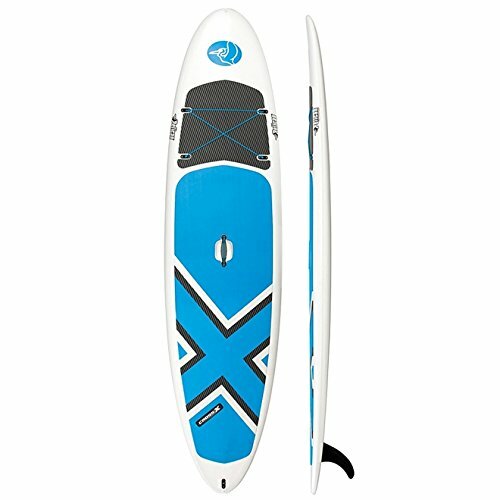 Overall, this is a solid SUP and a decent board for those on a budget. You’ll be extremely hard pressed to find a solid construction SUP for cheaper less than what Pelican makes ’em for. That said, if you’re on a tight budget (>$750) my recommendation would be to look at inflatable paddle boards. This Pelican SUP is more or less the same as the Rush 11.6 except for the fact it is exactly 12 inches shorter! That’s right; the Rush 10.6 is 10’6” and has the same lightweight foam core with the durable polyethylene outer shell. It also includes the same bow bungee, padded anti-slip deck pad and inset center handle as its bigger brother. Again, it is substantially cheaper than most SUPs on the market and is a great choice for those interested in the sport but unsure as to how much they love it. While $699+ is still a major investment, it isn’t as steep as the $2,000+ paddle boards you can get elsewhere. You need to be a lightweight to enjoy the Rush 10.6 as its maximum capacity is just 190 pounds which we feel is a little on the light side. Despite its size, this SUP weighs 40 pounds but it is a good choice for fit beginners who don’t mind the extra exercise of hauling the board around! 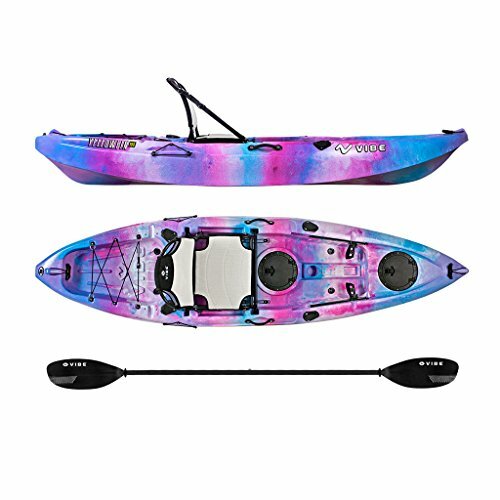 If you are seeking an SUP that provides extra stability, look no further than the Flow 116 which is one of the least expensive Pelican paddle boards. You can enjoy a ride on the Flow 116 safe in the knowledge your board is durable enough to survive close encounters with rocks and the various other hazards you will come across. This is thanks to the special Ram-X construction which offers extreme durability. The Flow 116 weighs 55 pounds but it does support riders of up to 260 pounds on its 11’6” frame. 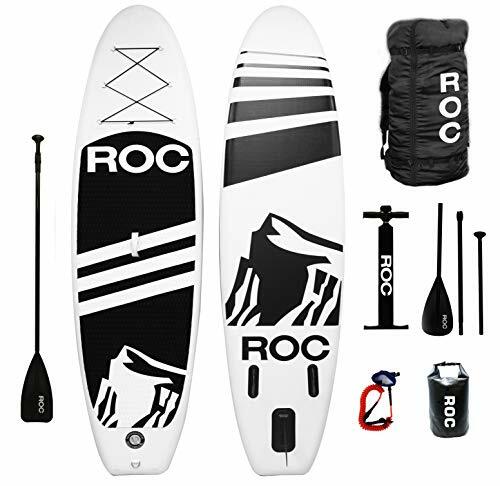 It comes with a bow bungee cord and is the perfect all-round SUP since it can be used for exploration or touring. The board handles very well and provides the promised level of stability in narrow and tight creeks and open flats. You can use the paddling on the board to stand comfortably for a number of hours and not only does it allow you to cruise at a good speed, it is also quiet enough for anglers to sneak up on unsuspecting fish. Overall, you should have a great day in the Flow 116 as mounting, sitting and standing are all very comfortable. 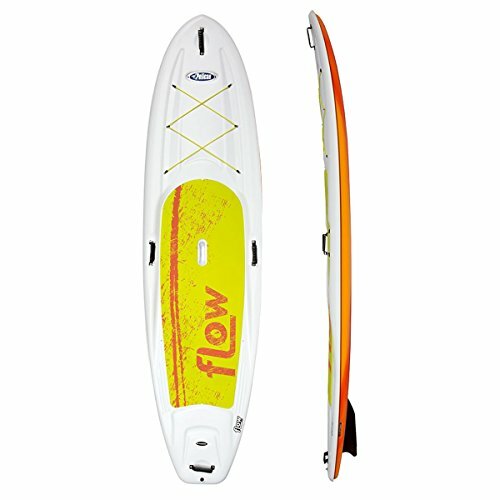 The Flow 106 is one of the most unique SUPs around because it is made from thermoform plastic; this is a material best associated with kayaks. While most of Pelican’s boards are generally made for touring and recreation, one could argue the Flow 106 could be used with whitewater in mind. Although the board rides low and has various drill holes in it, little water actually gets in. The Flow 106 is very stable and while you should avoid using it in serious whitewater, you can have fun in easy whitewater and flatwater. It isn’t the best option for serious touring however since it is a bit short and only has one fin. This SUP is made using Pelican’s Ram-X construction so it is ding-resistant. It weighs 48 pounds though it feels lighter; possibly due to the thin and stiff thermoform material. The Flow 106 is 10’6” long and can handle riders weighing up to 230 pounds. If you want to have a great time exploring local lakes and rivers, try the small yet sturdy Cross-X out for size. You can be assured of secure footing due to the Cross_X’s anti-slip zone and the unique concave standing surfaces helps you recover quickly and easily if your board begins to tilt. This makes it the ideal SUP for beginners. Other features included in this 8’ board are molded front and central handles for simple hand carrying, a removable tail fin, bottle holder, tail kick and drain plug. This is certainly a beginner’s board given its low price and the fact it only allows riders who weigh 140 pounds or less. It weighs just 33 pounds so it is light, small and easy to carry. Overall, this is well worth considering as a ‘first’ SUP for younger and lighter riders. If you’re looking to buy your kids or grandkids a stand up paddle board this is a terrific option. We hope you enjoyed our reviews of the above Pelican paddle boards and hope what you read can help you make the right choice when it comes to purchasing an SUP.